As you open the pages of the Bible, you step into the greatest story of all. Rich in historical accuracy, the biblical story, written over thousands of years by dozens of authors, it is stunning in its symmetry and cohesiveness. Through the Scripture, God makes extraordinary promises to you and me. The Bible claims it can make us wise, bring life to our souls, open our eyes to see who and whose we are, fill our hearts with joy, make us purposeful, give our lives meaning, restore what has been lost and protect us from a shipwrecked life. Every philosopher, scientist, civilization, poet, religion and everyday person has a story of beginnings. As Jesus people, our story begins with a creating God. The text underscores that you are created in the image of God. Thus, your origination was in the mind of a majestic God. Everything beautiful, spiritual, wonderful and eternal about you is the result of his divine image woven into your spirit from the start. The triune God (“Let us make mankind in our image,” Genesis 1:26) works through the Son to bring about the creation of everything. “For in him [Jesus] all things were created: things in heaven and on earth, visible and invisible, whether thrones or powers or rulers or authorities; all things have been created through him and for him” (Colossians 1:16). In the beginning Jesus created everything. Every story has a problem. The problem for humanity is sin. Though welcomed into paradise, Adam and Eve had free will. Choosing to attempt to become like God, they fell into physical and spiritual death. The consequences were severe and humankind was separated from their Creator. Yet, in mercy, God sacrificed an animal and made a covering for the man and woman. This covering was a picture of what was to come — forgiveness and righteousness through the sacrifice of Christ. When people revolted, God had already set in motion a plan of salvation through Jesus Christ. Every story has participants — those who are going to be impacted by the unfolding drama. The fall resulted in mankind’s struggles with hardship of every kind. But God was not silent. Through Abraham, God commissioned a people to be his — a special chosen people who would be a witness on earth of his faithfulness. God showered them in blessing, yet they constantly reverted to sinful ways. Time and time again the people rejected God, their decisions ultimately leading them to oppression and loss. Invariably, they called out to the God they had forgotten, and God, in turn, always showed mercy. At each turn of this vicious cycle of death and destruction, God would announce through a prophet a coming Savior, Jesus Christ. Every story has a hero. In this story his name is Jesus. The Bible says that in the fullness of time, God’s promised Savior was born in a stable. Jesus did what no other could do, by bringing an end to the system of sacrifice and ritual. Once and for all, Jesus appeased God’s wrath through his death on the cross, opening the way for rebels to come home to a peace-making Father. A star led the shepherds to the place of Christ’s birth, but history has been pointing to Jesus since time began. Jesus is God’s appointed and God’s anointed. He is the way, the truth and the life. All come to the Father through him (John 14:6). Every story has an effect. The church is made up of a people who have been redeemed by Jesus and have been formed to live on mission with him. Once Jesus was raised from the dead and ascended into heaven, he sent the Holy Spirit to give birth to his Church. While churches come in all shapes and sizes, the true Church of Jesus is comprised of all who have confessed him as Savior and Lord. A living organism, his body, the church, serves to extend his grace and truth on earth. Powered by that same Spirit, the church exists to proclaim Jesus’ glory to all people. Every story has a resolution. At a time only the Father knows, everything in heaven and earth will be put right once and for all. Those opposed to Jesus will get what they have asked for — an eternity without his goodness and glory. The redeemed will gather in his presence from every race and nation, singing the song of Jesus who rescued them from death and brought them into unending life. If you approach the Bible with an open mind, I am confident you will be met by the Spirit of God who breathed these words into existence. He promises that “he will guide you into all the truth” (John 16:13). Ultimately, you will come face to face with the One who appears on each page and in every act. You will soon discover that it is Jesus whom the story is all about. And that’s the goal. For as precious and enduring as the Bible is, you were not made for information alone, but for a relationship with Jesus. He is the One who helps us see that truth is not simply a thing; rather, truth is a person. Truth is in Jesus and Jesus is truth. He alone is the one who ends death and gives life to all who hope in Him. 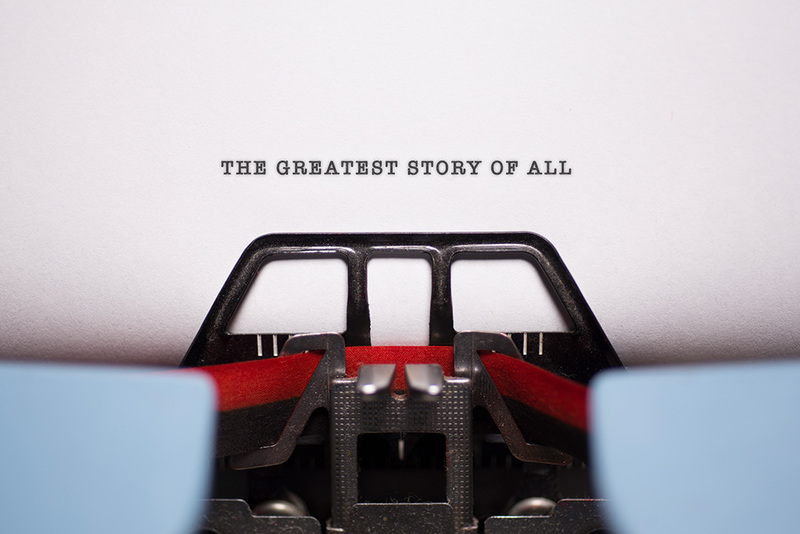 Have you ever thought of the Bible as one grand story? How encouraging is it to think about the sweep of history and God’s plan for you in it? Article drawn from “Welcome to the Story of God!” by Louie Giglio, in The Jesus Bible, NIV.